EVENT INFORMATION: Join us on the first Saturday in March in the reenactment of the “1668 Sack of St. Augustine” in St. Augustine Florida, our nations’ oldest city. During the day a 17 century-style military encampment will be open to the public at the Fountain of Youth Park (Free with paid admission) and will play host to drills, demonstrations and living history interpretation from 10:00 AM to 4:00 PM. The reenactment of the sacking and burning of the town will commence Saturday evening at 4:30 PM in the old city, beginning at the Plaza and ending at the Old City Gates. We are always looking for new recruits to portray townspeople, garrison soldiers, Native Americans, and buccaneers! Our focus is on an accurate historical impression, using correct materials, styles, and equipment. You need not be a historian, actor, or military enthusiast to participate however if you are interested please be sure to read the Rules & Information. The “Sack of St. Augustine: Capt. 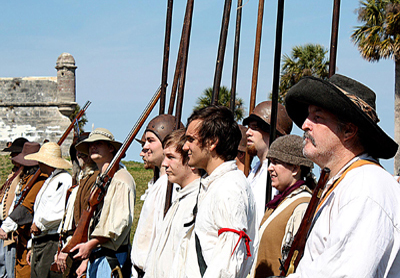 Robert Searle’s Raid of 1668” is a historical reenactment sponsored by Searle’s Buccaneers and the Men of Menendez (members of the Florida Historic Militia), with the assistance of the St. John’s County Tourist Development Council. Pikemen form up before drill. Many of our newer members take part in the pike block, as muskets can get expensive! 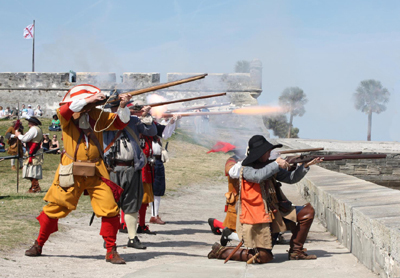 Searles Musketeers firing at the sea wall in St. Augustine. The direct result of the attack, the Castillo San Marcos , is in the background. St. Augustine, Florida, that “noble and loyal city” is the oldest inhabited European settlement in North America. Founded by Don Pedro Menendez de Aviles in 1565, it was a valuable outpost of the Spanish Empire, serving as a haven for the imperial treasure fleets sailing from the New World to Spain. For over a century and a half, beginning with Sir Francis Drake’s raid in 1586 and ending with General James Oglethorpe’s attack in 1743, English troops and buccaneers repeatedly tried to wrest this strategic port from the Spaniards. In 1655, Oliver Cromwell’s “Western Design” resulted in the capture of Spanish Jamaica, thus providing English freebooters with a safe base from which to plunder the Spanish Main. The “Golden Age of Piracy” had begun! In 1668, Captain Robert Searle and his privateers sailed from Jamaica to loot the silver ingots held in the royal coffers at St. Augustine. Under the cover of night, they slipped into the harbor and attacked the sleeping town, killing sixty people and pillaging government buildings, churches and homes. The devastation wrought by these bloodthirsty pirates prompted Spain’s Council of the Indies to issue money to build a massive stone fortress on Matanzas Bay to protect the city. The Castillo de San Marcos still stands as an enduring reminder of Florida’s exciting heritage! Searle’s Sack of St. Augustine is made possible in part by a grant from the St. Johns County Tourism and Development Council. Searle’s Sack, the annual event that re-creates the famous bloody pirate raid on St. Augustine in 1668, takes place on the first Friday and Saturday of March. This deadly raid was led by Robert Searle when he and his crew laid siege upon the city and its inhabitants. In 1668, Captain Robert Searle and his privateers sailed from Jamaica to loot the silver ingots (metals that can be shaped into various things) held in the royal coffers (small chests) at St. Augustine. Under the cover of night, they slipped into the harbor and attacked the sleeping town, killing sixty people and pillaging government buildings, churches and homes. The devastation wrought by these pirates prompted Spain’s Council of the Indies to issue money to build a massive stone fortress on Matanzas Bay to protect the city. The Castillo de San Marcos still stands as an enduring reminder of Florida’s gripping heritage. The procession that commemorates the arrival of the raiding pirates and introduces this annual event will begin at the Cathedral Basilica at 4:30 p.m. on the first Friday of March , and will proceed north on St. George Street to the Santo Domingo Redoubt on Orange Street. The Searle’s Sack encampment will take place on the first Saturday of March, from 10 a.m. to 4 p.m. at the Fountain of Youth Archaeological Park. Visitors can see colonial St. Augustine in action at this living-history camp, where there will be period demonstrations with weapons, clothing, and equipment, as well as reenactments of camp life and social activities. The reenactment of the battle between the freebooters and the city’s Spanish defenders will take place in St. Augustine’s historic district at 4:30 p.m. on the first Saturday of March, beginning at the Plaza de la Constitución and ending at the Old City Gate. The English brigade will head up St. George Street from the Plaza toward the city gates, and the battle will commence when the English try to invade the Spanish defenders who will be stationed at the Santo Domingo Redoubt off Orange Street across from Potter’s Wax Museum. Living history gets real when the period re-enactors demonstrate how the Spanish settlers had to fight off Searle and his pirates. Admission: Events in the historic district are free. The encampment at the Fountain of Youth is a free with regular park admission: $15 for adults, $14 for seniors (60+), $9 for children ages 6-12, and free for toddlers 5 and under. When: The event begins with a downtown procession at 4:30 p.m. on the first Friday, of March. The encampment at the Fountain of Youth is open from 10 a.m. to 4 p.m. on the first Saturday of March. On Saturday at 4:30 p.m., the reenactment of the battle takes place in the historic district. Where: The procession on Friday event and the battle reenactment on Saturday begin around the Plaza de la Constitución in the center of St. Augustine’s historic district and proceed north on St. George Street, ending at the Santo Domingo Redoubt on Orange Ave., just across from Potter’s Wax Museum. The encampment during the day on Saturday is at the Fountain of Youth Archaeological Park, which is located at 11 Magnolia Ave. in St. Augustine FL 32084.